The Stumpjumper was born in the 80's as the first ever production mountain bike and has since provided explosive speed, unmatched handling and unrivalled technology. The redesigned Turbo Levo takes the benefits from all the years of research and design put into the Stumpjumper and added a kick of power that allows you to reach heights never achieved before. In its Women's specific design, this Turbo Levo features a high-quality M5 aluminium frame, that helps to lower the cost and is backed by Specialized's lifetime warranty as well as featuring SRAM's 1x11 speed groupset, allowing you enough gears to get up the hills and then speed down them. The improved M1-500 battery, compared to the Women's Turbo Levo hardtail, provides the power you need to boost you up the climbs and keep you in touch with your partner or group ride and the matching 150mm front and rear shock helps to soften the blow of tough trails and tricky descents. 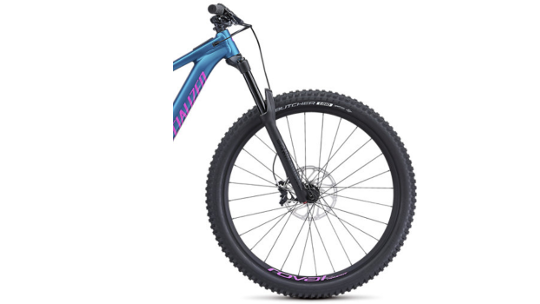 Finally, Specialized 29er geometry ensures comfort and speed whilst in the saddle 100-120mm of travel at the front adds the comfort you need for the rockiest of trails. 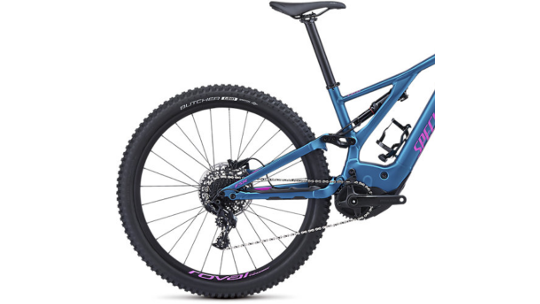 The completely redesigned alloy Levo frame features an M5 alloy front- and rear-end, an asymmetrical design, and Specialized's 29 Trail Geometry, so it's just the right amount of both capable and comfortable. Kinematics of the frame have also been perfected, along with rider-tuned stiffness. Cable routing is all internal, including that of the Command Post IR, while the battery is fully integrated in the down tube, while the minimalist motor is mounted in a more secure, lighter way. 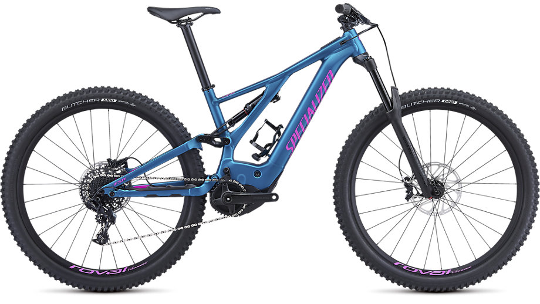 The custom Specialized 2.1 Rx Trail-tuned motor is more efficient, 15% smaller, and 11% lighter than its predecessor. This successfully places it at the top of e-bike motor technology. It has many other features that no other e-bike can touch, like instant engagement, fantastic heat management, a double freewheel design that disengages the gearbox when you hit top speed, and silent, smooth, and consistent output—even at max power. Front & Rear Tyre - Butcher, GRID casing, GRIPTON® compound, 2Bliss Ready, 29x2.6"